[131 Pages Report] The heat interface unit market is expected to witness high growth during the forecast period. The overall market is expected to grow from USD 342.3 Million in 2016 to USD 591.3 Million by 2023, at a CAGR of 7.9% between 2017 and 2023. The base year considered for the study is 2016, and the forecast period considered is between 2017 and 2023. The objective of the report is to provide a detailed analysis of the market based on component, product, application, and geography; information regarding the major factors influencing the growth of the market (drivers, restraints, opportunities, and industry-specific challenges); and a detailed value chain analysis. Moreover, the objective of this report is to strategically profile the key players and competitive landscape for market players, and provide information on product launches, acquisitions, partnerships, agreements, contracts, and collaborations in the heat interface unit market. The research methodology used to estimate and forecast the size of the heat interface unit market begins with obtaining the data on key vendor revenues through secondary research. Some of the secondary sources used in this research include information from various journals and databases such as IEEE journals, Factiva, Hoover’s, and OneSource. The vendor offerings have also been taken into consideration to determine the market segmentation. The bottom-up procedure has been employed to arrive at the overall market size for heat interface unit from the revenue of the key players. This data triangulation and market breakdown procedures have been employed to complete the overall market engineering process and arrive at the exact statistics for all segments and subsegments. The analysis of the heat interface unit market includes extensive primary research to gather information, verify, and validate critical conclusions arrived at after an extensive secondary research. The ecosystem for heat interface unit comprises manufacturers such as Armstrong Fluid Technology (Canada), Bosch (UK), Dutypoint (UK), Honeywell (Switzerland), Kingspan (Ireland), GIACOMINI (Italy), Docherty (UK), Caleffi (Italy), ALFA LAVAL (Sweden), Danfoss (Denmark), Rhico , Thermal Integration , Reliance Worldwide Corporation (UK) , and Intatec (UK). 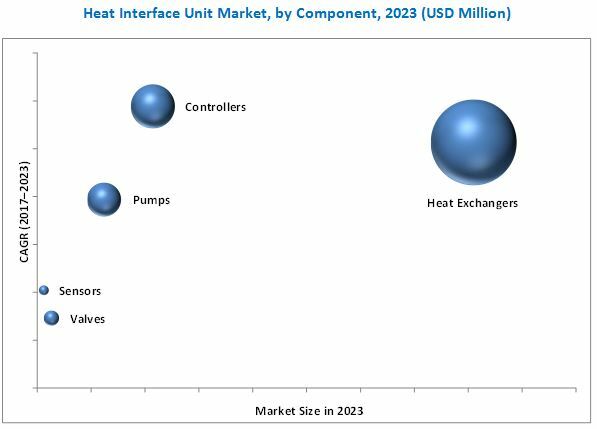 The heat interface unit (HIU) market is expected to grow from USD 374.7 Million in 2017 to USD 591.3 Million by 2023, at a CAGR of 7.9% between 2017 and 2023. The major factors driving the growth of this market include the increasing supportive regulatory and legislative framework, growing use of district heating (DH) solutions, and rising adoption of smart homes in developing nations. This report segments the heat interface unit market on the basis of component, product, application, and geography. The heat interface unit market for commercial applications is expected to witness a significant growth during the forecast period owing to the increasing installation of heat interface units in commercial buildings and institutes. Heat exchangers accounted for the largest share of the heat interface unit market in 2016. This growth can be attributed to the growing demand for indirect HIUs for residential, commercial, and industrial applications. The heat interface unit market for indirect HIUs is expected to grow at the highest CAGR between 2017 and 2023. This high market growth rate can be attributed to the rapidly growing adoption of heat interface units in smart homes and multi-housing apartments in developing nations. Europe accounted for the largest share of the overall heat interface unit market in 2016 since HIUs are highly in demand in the European region than other regions. Unawareness about HIUs in key economies such as the Americas and APAC is one of the challenging factors impeding the growth of the heat interface unit market. In countries such as the US, Canada, México, China, India, and Japan, industry players/construction contractors are yet unaware of the long-term benefits of heat interface units. In some countries, construction contractors/industry players have started to prefer district heating solutions with combined heat and power (CHP) systems, but they are not keen on using HIUs in each flat/apartment. As a result, the market size for HIUs in the Americas and APAC is smaller compared to the European market. Strong marketing and promotional activities will promote the use of HIUs in these regions. The key players in this market are Armstrong Fluid Technology (Canada), Bosch (UK), Dutypoint (UK), Honeywell (Switzerland), Kingspan (Ireland), GIACOMINI (Italy), Docherty (UK), Caleffi (Italy), ALFA LAVAL (Sweden), Danfoss (Denmark), Rhico , Thermal Integration , Reliance Worldwide Corporation (UK) , and Intatec (UK).